Pick up from the hotel is earlier than usual at 6.30 am, since it is about 275 km to Senbete or about 5 hoursf drive up the main road north, or the Asmara road. There is spectacular mountain scenery en route. We should aim to get to the market before it gets hot, and before the other shoppers imbibe too much local beer, honey wine and home distilled spirits! Markets in Ethiopia are not only about buying and selling, but are major social occasions, where people meet and exchange information. Once the business is done, the socializing begins. We will have our lunch in local restaurant , local restaurant or on the way to Kombolcha on good view point then keep on going, arrive Kombolcha overnight Sunny side/Tekle Hotel at Kombolcha. Morning after breakfast drive to the way to Danakil Depression but only 50km for the most interesting Bati cattle market here again we find the congregation of different ethnic group with local products and the livestock, the market is interesting photogenic for photographer and also for those appreciating the natural beauty and colorful dressing of the Afar, Oromo and Wello of Amhara region women. Retrace to Kombolcha have your lunch the at the hotel we stayed last night and then drive Weldeya, We will stop at the Hike Estifanos Monastery earlier used by scholars of the other monasteries and religious leaders in the country. Overnight Lal hotel at Weldeya. Drive to Lalibela leaving Weldeya, the town on the foot base of Abuna Yosef Mountain along the scenic road en route visit the Genete Mariam monolithic church 17km before the Town of Lalibela. Overnight Mountain view/Roha/Tukul hotel. The city contains 11 monolithic churches that were built in the 12th century and are carved out of the pink tuff rock; they have been classified as a UNESCO World Heritage Site. Each church (Bet) has a unique architectural style; all are superbly carved and most of them are decorated with well-preserved paintings. The entire city may be described as a sculpture dedicated to the glory of God. AM is dedicated to visiting the first group of churches, known as the Northern Group of Churches. 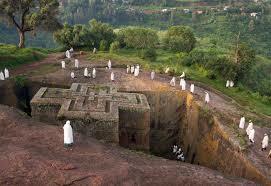 Bet Medihan Alem is the largest, supported by 72 pillars and houses the 7kg (15 lbs) gold Lalibela Cross. We go through a tunnel from Bet Medihan Alem to Bet Mariam, in which there is a pillar; it is said that Jesus Christ leaned against this pillar when he appeared in a vision to King Lalibela. Bet Mariam also contains fabulous carvings of various birds and animals. We also visit Bet Danagel; a chapel built in honor of martyred nuns. Bet Golgotha and Bet Mikael are twin churches and many believe that a visit to Bet Golgotha. The twin churches also contain many important religious items and some of the best examples of early religious art in the country. The last church we visit today is Bet Georges, one of the more recent churches and best preserved. We walk back to our hotel and on the way back if time allows, we will have stops at the souvenir shops and around the city center. PM we will visit the Eastern Rock Churches. 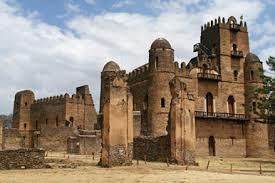 Bet Amanuel is one of the most beautifully carved churches in Ethiopia in the Axumite style. Bet Merkorios has a wonderful painting of The Three Wise Men, which dates back to the 15th century A.D. We also stop to see Bet Abba Libanos and Bet Gebrieal-Reafael, which might have once been the home of the royal family before becoming a church. This afternoon, we visit the Nakuto La’ab Rock Hewn Church, built under a natural cave. Tonight, we have a special treat, participating in The Coffee Ceremony, a ceremony of hospitality in Ethiopia.Overnight Roha/Mount View/Tikul hotel at Lalibela. Drive to Mekelle through beautiful mountain scenery via Korem-Sekota on the way we drive to the cave church called Yimrehane Kristose (42 km from Lalibela). This Church has been constructed by King Yimrehane Kristose during the13th Century. In the church, there are more than 5000 thousand dead human skeletons lying without any coverage for the past 700 years. 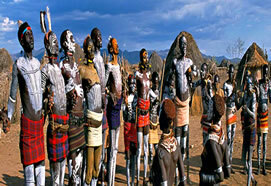 They are supposed to be pilgrimages from Syria, Egypt and Ethiopia. The murals on the dark walls of the church, the year round spring water – descending from the top of the church and the forest around are very impressive and worthy to be visited.Area and visit the Agaw and Amhara people at their village.Then we drive to Mekelle. 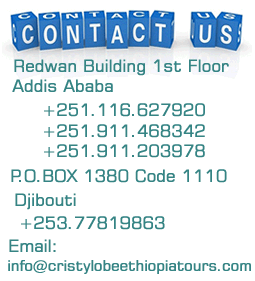 Overnight Axum/ Abraha castle hotel – Mekelle. Drive and explore full day the hidden treasure of Tigrian Rock hewn church of the Tebien cluster which includes Wukro Cherqos, Mariam Korkore, Abraha we Atsebeha, and Digum Silassie rock hewn churches. Overnight at Gherelta Lodge. Axum, the legends narrated in the Kebre Nagast (eBook of Kingsf) recount how the city of Axum as early as the 10th century B.C was already the city in which the Queen of Sheba resided. It is recounted that the son of the Queen of Sheba and King Solomon brought the Ark of the Covenant to Axum and it remains there to this day, preserved in a sanctuary. Famous long before the time of Christ, Axum was the capital of the long Axumite reign, one of the oldest African empires, and represented a crucial connecting-point between Africa and Asia for almost a thousand years. A visit is organized to the steles: granite monoliths dating from pre-Christian times and decorated with symbolic engravings. In ancient times, there were seven steals, the one in Rome – Mussolini brought it there during Italyfs occupation of Ethiopia was return to Axum and re-erected in its original place in 2004 . There is also a visit to the church of Saint Marry of Zion (Tsion), which contains the crowns of Ethiopian kings and other treasures. This morning we drive on the Tigrian Plateau after you pass the Shire Enda Silassie town then it start the most dramatic beautiful scenery in the country driving through mountain ranges and zigzag roads to Adi Arkay village leading into the Tekeze Valley with its Baobab trees, birds such as Hunterfs Sunbird, Nile Valley Sunbird, Rock Buntings, Superb Starling and more can be found. Debark, the head quarter of the national park here we the entrance fee and have the local park guide and scout to go with us for the day we stay in the park. Head to the Simien Lodge check in after short break for those wish to trek we will takes short hiking or it depend on the arrival to prolong trekking. 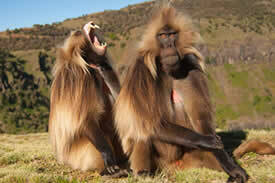 Overnight Simien lodge. Start early morning we will Trek and drive to the Extent of Chenek on jagged panorama of the Simien Mountains National Park, famed for its exclusive landscape, afro-alpine vegetation and unique wildlife, where we may spot the endemic Wallia Ibex, Gelada Baboon troops, Bushbuck, Klipspringer and if we lucky we spot Abyssinian Wolf. However, we will enjoy the dramatic scenery and a troop of friendly Gelada Baboon at very close distance and Birds such as Chestnut-napped Francolin, Mountain Thrush, Thick-billed Raven, Lammergeyer, White-collared Pigeon and Ankober Serin just to name a few. Arrive to the lodge check in, have lunch, after short rest, for those who interest in hike/Trek we will trek for about 2-3 hrs on the edge and beautiful escarpment to view the beautiful and green valley, wondering the long day eating and grooming of Gelada Baboon families and then trace back to the Lodge. Lunch will be picnic or at the Lodge. AM, Morning after breakfast drive back to Debark and stop at local café to say goodbye to our companion. it takes 2:30hours on all weather road from Debark to Gondar on the way visit the villages along the road, meet people at their field and photo stop for beautiful scenery then proceed to Gondar and Check in hotel. PM we will take a boat excursion to the famous island monastery Kibran Gabreal( closed to women)/ Debre Mariam near to the blue Nile outlet/Azwa Mariam and Ura Kidanemihiret which is reach in lavishly painted Biblical history on the wall of the Monastery. On your way back enjoy the beautiful Sun set on the Lake Tana. 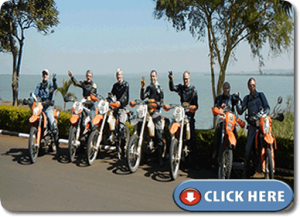 Overnight Tana/ Summer Land hotel at Bahir Dar. Morning after early breakfast check out hotel and drive to the Blue Nile Falls, which is known locally as Tisisat (smoking water) falls: 400 m wide, the water plunges for 45 m, giving rise to steam clouds and rainbows. We climb down to the base of the falls for an up-close look and then ascend to the other side. This round trip will take about 1hour walking. Then we cross the Blue Nile by boat to return to the point of departure. Drive to Debre Marikose on a paved road en route enjoy one of the beautiful and fertile highland known for Teff, the small and may very small crop species in the world, visit local houses in the village. Overnight Shebel hotel at Debre Marikose. Morning we start driving on the central highland (plateau) till where it bisect Showa plateau by the awesome Blue Nile gorge enjoy the beautiful landscape and visit the Debre Libanose Monastery on the cliff of Jamma River and then continue drive to Addis have lunch in local restaurant late afternoon arrive Addis. Overnight at hotel of your choice or this evening you can fly back home.